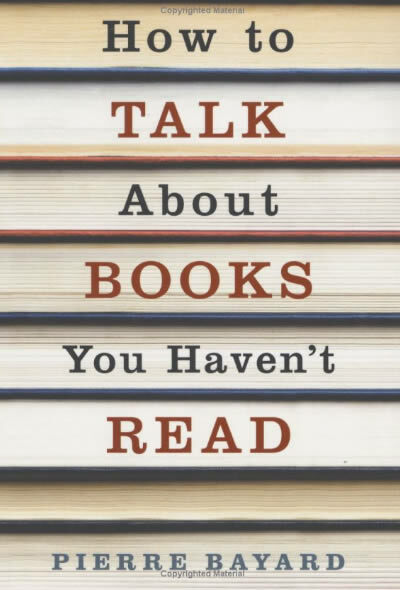 Pierre Bayard’s 2007 book How to Talk About Books You Haven’t Read is a real page turner. The best I can tell, it’s an elaborate joke in which the authorial voice is a kind of fictional character. This character –I’ll call him Bayard while remaining agnostic about how he relates to the historical Bayard who actually authored the book– is utterly devoted to non-reading, and is impenitent about combining so much talking about books with so much non-reading of books. In his posthumously published book Against Sainte-Beuve, Proust advanced the theory that a literary work is the product of a different self from the person we know; in A la recherche de temps perdu, he illustrated this theory through the character of Bergotte. And the footnotes dutifully record Bayard’s interaction with the two texts: HB+ and HB++, respectively. It’s a breathtaking kind of honesty. Imagine if all authors had to make some notation of the actual depth of their familiarity with every book they referred to! Later he shows that he can say intelligent things about Joyce’s Ulysses (HB++), such as its relationship to Homer’s Odyssey (SB and HB++). Reading is first and foremost non-reading. Even in the case of the most passionate lifelong readers, the act of picking up and opening a book masks the countergesture that occurs at the same time: the involuntary act of not picking up and not opening all the other books in the universe. or “the interior of the book is less important than its exterior, or, if you prefer, the interior of the book is its exterior, since what counts in a book is the books alongside it.” One almost (note quite –just almost) feels sorry for the poor graduate student who inevitably misses the joke and hangs a whole dissertation on this bold new non-literary non-theory. Heady stuff! At least I think it’s heady stuff. I have to admit that I borrowed the book via inter-library loan, and it’s due back today, so I’m returning it SB++. Feel free to share this post about it HB+, if you like. Some Poetry with Your Haircut, Sir?